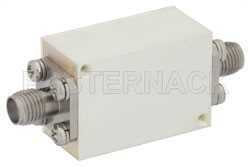 Highpass filter PE8715 from Pasternack is part of our extensive line of in-stock RF components for sale. Our high pass filter is manufactured with SMA connectors that are female and in a 5 section design. This 5 section SMA highpass filter has a VSWR of 2 and a maximum power of 5 Watts. Frequency range of this band pass filter is 1,000 MHz to 2.5 GHz and the passband is 1.5 GHz. 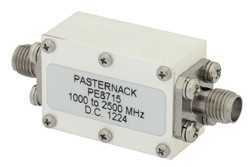 PE8715 highpass filter is one of over 40,000 RF microwave and millimeter wave components supplied by Pasternack. Our 5 section highpass filter can be bought and shipped worldwide the same-day as with our other in-stock RF parts.